(or arguments) on a church door in the town of Wittenberg. Within four years, he had been excommunicated and the Christian family tree had broken into Catholic and Protestant branches. In truth, the Reformation was not so much an event as a process, both older than Luther and continuing into our own time. and sinner,” why should a community of Christians be any closer to perfection? Seen in this light, the 500th anniversary of the Ninety-five Theses is not only an occasion to celebrate Luther’s Reformation. It is a time to recommit to an ongoing reformation. Indeed, that’s our heritage in the Evangelical Covenant Church, since we’re a “Reformation church” that inherits its Protestant beliefs by way of a later attempt at continuing reform: the movement known as Pietism. What Ryrie means is that Protestantism has always had less to do with intellectual belief than with the lived experience of God’s love—which then flows into love of our neighbors. But as a young Lutheran pastor named Philipp Spener looked at German churches in the 1670s, he saw too much “dead orthodoxy” and too little heartfelt faith. Spener had grown up at the end of the Thirty Years War (1618–1648), in which Catholics and Protestants slaughtered each other at a rate not surpassed until the world wars of the twentieth century. The price of peace was that Germans stayed divided among competing churches, which spent more time cultivating political connections and bickering over their doctrinal confessions than encouraging spiritual growth or social reform. Spener and his followers instead preached a simplified faith that was made active in love of others. Mockingly called “Pietists” by their critics, they published Bibles, wrote hymns, prayed in small groups, and shared their stories of conversion. They also cared for the sick, gave homes to orphans, educated children of all social classes, and sent missionaries around the world—all in the confident hope that God brings about “new life” for individuals and “better times” for the church and the world. They even dared to suggest that Christians should avoid “needless controversy” on minor doctrinal issues and instead try to reunite the body of Christ. 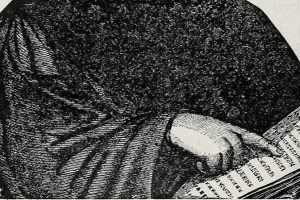 So how can our Pietist heritage help us to take up the ongoing work of reformation, five hundred years after Luther? How can we cultivate a living faith in our own time? First, we need to recognize that Pietism requires a conscious decision. It can’t be inherited from family or absorbed from the surrounding culture. It requires us to reject the anxious pull of fear, the angry rhetoric of division, and the deceptive security of power and prosperity. To choose the Pietist option is to opt in to a distinctively hopeful way of following Jesus Christ: to seek to grow more and more like him, to live at peace as part of his body, and to fulfill his mission in service to others. #2 Live out your faith in love of neighbor. “We love God’s word,” Walter told delegates to the 132nd Annual Meeting in June.“We ask, ‘Where is it written?’ and do our best to align with it, even when it is costly to do so.” But “Where is it written?” is most meaningful in light of another familiar Covenant question: “How goes your walk with Christ?” Reading the Bible is a kind of study that doesn’t only change how we think—it changes how we act. #3 Form yourself and others for Christian unity. Alas, it’s hard to love our neighbors when Christians scarcely seem to love each other. “For the whole law is summed up in a single commandment,” wrote the Apostle Paul, “‘You shall love your neighbor as yourself.’ If, however, you bite and devour one another, take care that you are not consumed by one another” (Galatians 5:14-15). Yet churches are often fractious communities, whether it’s the first century or the twenty-first. Again and again, Paul exhorted early Christians to “clothe yourselves with love, which binds everything together in perfect harmony” (Colossians 3:14), to “maintain the unity of the Spirit in the bond of peace” (Ephesians 4:3). Nothing less than our witness and our mission depend on doing what Paul urged. Jesus prayed that his followers “may become completely one, so that the world may know that you have sent me and have loved them even as you have loved me” (John 17:23). Those who “bite and devour each other,” by contrast, will make poor ambassadors of Christ’s ministry of reconciliation. This doesn’t mean uniformity or conflict avoidance. But it does mean that we need to recognize that our old Protestant instinct to separate is worsened by our immersion in a polarized society that is sorting Americans into different tribes. Lest we be conformed to that world, we need to engage in formative practices that make us capable of a countercultural unity. In the end, the Pietist option is to live in active expectation that the God of the resurrection works through people as imperfect as us, to reform his flawed church and, through it, to renew the weary world he loves so much. 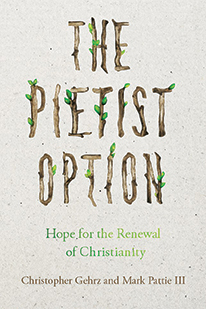 In The Pietist Option (October release), Covenanters Chris Gehrz and Mark Pattie show how Pietism holds great promise for the church—and the world—today. Modeled after Philipp Jakob Spener’s 1675 classic, Pia Desideria, the book makes a case for the vitality of Pietism in our day. With its emphasis on our walk with Jesus and its vibrant hope for a better future, Pietism connects with the ideas and issues of our day. This book offers a revitalizing option for all who desire to be faithful and fruitful in God’s mission. Always reform with repentance not compromise which is epidemic.